That is, you can't if you're me, because the store it's from, the UK High Street chain Topshop, is so completely sensory-overload, all the time, that even if you do dare wander in, you wander out again shortly, dazed, bleeding from your ears, and uncertain of basic information that you went in with, like your date of birth and what the hell you were looking for in the first place. So you think, oh, okay, it's 2005, now they must have a web site! And of course they do, and it's a flashtastic eyefuck of A Clockwork Orange proportions, and it's all you can do to grab this screencapture and get out of there with your on-good-terms relationship to your retinas intact. So. 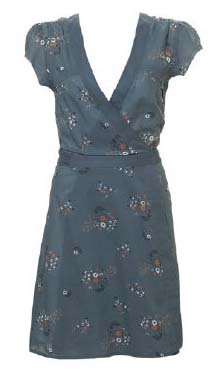 Click on the image, if you dare, to try to purchase this £35 dress. I didn't even get as far as checking their international shipping rates. If you get in and get out without turning into a drooling mess, please report back. You'll get a hero's welcome. I couldn’t even FIND that dress. What an irritating website. International shipping: contact them at info@zoon.co.ukGEE THANKS TOPSHOP! YOU MAKE THIS SO EASY!That said, I do rather like their large collection of Dr. Pepper-inspired jackets. Sad that the website is giving me a seizure. How odd, I JUST saw that dress on the Top Shop website yesterday, and tried to see what it would cost with shipping, etc., but no, I couldn’t. I also couldn’t find a sizing chart. But I do love it. PS – Didn’t know you had started this site – well done. Welcome (for specifically ADAD) to the b’sphere! I have just started reading your site from the beginning and this entry is hilarious! I have been to TopShop and know of what you speak, but even without that experience, I am sure I still would have laughed out loud!